Franciacorta is a toponym, a place name and the name of an Italian wine appellation. Franciacorta is also the name of the classic method sparkling wine that is made there. And franciacortino/a is the adjectivized form of Franciacorta. It can mean of or from Franciacorta. And it can also be used as an ethnonym to denote a person from Franciacorta. Una franciacortina in cucina is a wonderful food blog by franciacortina Arianna Vianelli, who also works with the Franciacorta consortium as its in-house caterer. Her blog is devoted primarily to Franciacorta’s rich culinary traditions and she posts wonderful photos and recipes (in Italian) on a weekly basis. 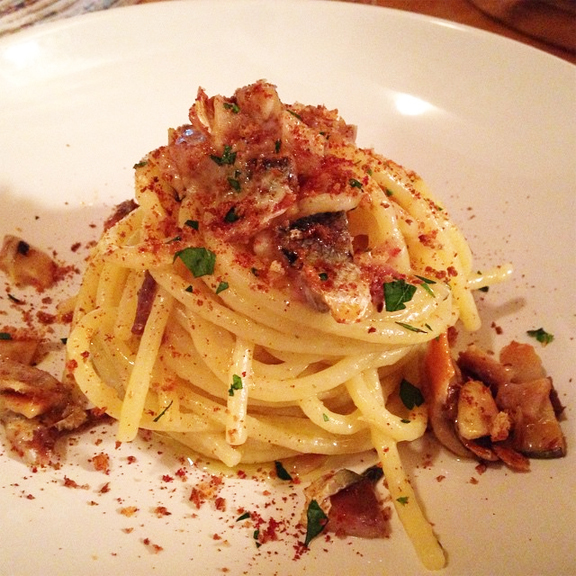 Check out her awesome post on spaghetti with cured sardine from Lake Iseo, a supreme classic of franciacortina gastronomy and a traditional pairing for Franciacorta (wine). Don’t be surprised if you happen to find a translation of her recipes here from time to time (I took that photo of her spaghetti with sardine dish back in November 2014). Even if you don’t speak Italian, a little bit of cookery skill and Google Translate make Arianna’s blog highly accessible and easy to follow. The photos alone are worth the price of admission.